Last time I discussed how jobs were no longer in the government or in industry, but in the service sector. I did not discuss retail last time, but the same could be said about retail jobs as could be said about the government and industry jobs. The government has shank its budget, privatized most industries and outsources services. Industry outsources production, and technology means faster and more automatized production. Retail is now mainly through delivery systems, which rely on distribution systems which are part of the service industry. Few people go to stores to purchase a phone, a book, or a shirt for that matter. The main components of the service industry is that they tend to be small businesses, often individual businesses, that provide services, be it in the food industry, in the entertainment industry, in the financial industry, in the business industry or in the education industry or what have you. They can go from business matchmakers to financial and tax advice, to restaurants and pubs, to YouTube content creators to freelance musicians or photographers, to alternative medicine, to health, lifestyle or beauty gurus. But as I discussed last time, the current economy does not accommodate the service industry very well, and here's what's wrong. To put it bluntly, Amazon and Wall Mart control the retail industry, industrial products are outsourced and automatized and the government does not provide decent jobs. So many people would rather provide a service that they trade for money. Services require specialization when the education system provides general knowledge. 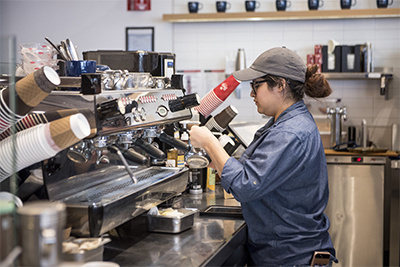 The service industry requires skills such as knowledge of the product, networking and financial management knowledge, when the school system provides general humanities and science education and teaches to the test. What I recommend is that students spend one or two days a week working on learning about a service of their choice and perfecting their skill and knowledge of the service. Since internships are obsolete, students should then, say, in high school, work one day a week providing their service, be it cooking, knitting, taking pictures, filming, putting makeup on other people, providing an education service or a financial service or what have you. Since jobs are no longer 9 to 5 with severance pay, end of year completion bonus, private pension scheme and two weeks paid vacation, the job market needs to adjust to the service industry. Since the service industry is providing a service and being paid for a service, a lot of times a contract is not required for a service. You can imagine having to sign a contract at a restaurant. However, invoicing is an important part of the service industry, and just as you get your receipt after eating at the restaurant, the service industry needs to find out clearly who gets the receipt. Disputes arise in the service industry, yet a lot of times are complicated to solve because new precedents spring up all the time. Can I sue my lawyer if I lose a case? Can I sue my makeup artist if they didn't put makeup on properly? Can I sue my tattoo artist if they screwed up my tattoo? Can I sue my Spanish tutor if they failed to teach me Spanish? What if I'm a photographer and decide to overcharge because I was forced to work in the blistering cold outside when I thought I'd be working indoors for that event? All these are real questions. Needless to say, the government still works for industry and retail. The service industry is like at the bottom of the list. Yet millions of jobs depend on the service industry. The government needs to work specifically on how to better accommodate the service industry. Changing the education system, changing the taxation system, changing business regulations, communicating on freelancing and regulations surrounding the service sector in general. It used to be that we had a couple of friends we hung out with all the time and the rest of the world was non-persons, save our family. But in a service sector economy, you need to meet people, lots of people. And you need to be comfortable meeting lots of people. Furthermore, there are few or no associations or labor unions surrounding the service industry. That means a lot of times you're on your own, and have to learn the secrets of your industry on your own. Rather than social media, your best bet is to place ads in communities, at your local church bulletin board, at the bulletin board of crowded coffee houses or at school bulletin boards. You take pictures for bar mitzvahs? How old are people when they have their bar mitzvahs? Thirteen? Where do they go to when they are thirteen? School. Where do their parents pick them up? School. So if schools have a bulletin board, you want to put your announcement there. You get the idea. Social media is probably not the best place to advertise services. Social media does little to promote community events on the ground, and does little to facilitate encounters between people who meet for the first time. That's where the importance of pre-established communities sets in. The more you are part of a community, the easier it will be to provide services. A lot of questions remain. How do you train people to provide services? What services require mandatory training? How do you help people adapt to changes in technology and other changes to adapt to the service industry? More importantly, how do you protect people who work in the services industry, financially, from competition and otherwise.